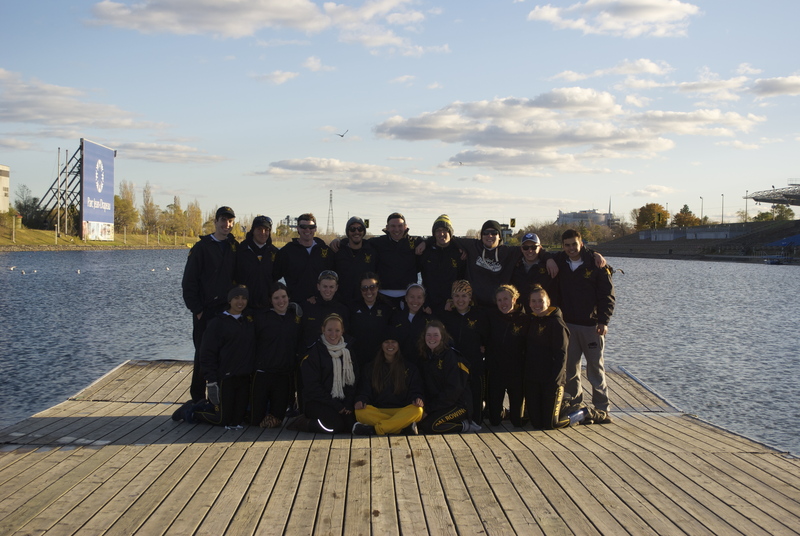 The Dalhousie Rowing Club competed at the 2013 Canadian University Rowing Championships on Nov. 2 and 3 in Montreal, QC. This is the first time in six years that the university has competed at nationals. Dalhousie does not offer rowing as a varsity sport, unlike many of the schools the club competed against over the weekend, so athletes are required to pay all rowing and trip expenses through fundraising and their own cash. Last year’s regatta took place in British Columbia, so the team was very excited to take advantage of the shorter travel distance. A competitive team of almost 30 male and female athletes has been training six mornings per week at 5:30 a.m., with additional afternoon practices, since the start of the school year. The team rows out of the Halifax Rowing Club on the Northwest Arm. This season, the team competed at the Head of the Four Bridges Regatta in Fredericton, NB, the 155th annual Cogswell Championships and Northwest Arm Regatta in Halifax, NS, the Really Chili Regatta in Dartmouth, NS and the seventh annual Atlantic University Rowing Championships in Antigonish, NS. This year, Dal won the University Championships and received the first annual Lochaber Cup. In Montreal, the men’s and women’s crews placed ninth and tenth respectively out of 26 schools, an impressive feat for a club team. They also had the distinction of being the top Maritime finisher. Several members of the team have been involved in rowing for a number of years. MacLellan competed with the Nova Scotia provincial rowing team at the 2009 Canada Summer Games in Summerside, PEI, and moved on to competitive coaching and won the 2013 Row Nova Scotia coach of the year at the RICOH Sports Awards. As well, Dal rower Connors Booker and rower Emily Chedrawe competed on the Nova Scotia provincial rowing team at the 2013 Canada Summer Games in Sherbrooke, Quebec. The team also includes some less experienced rowers who are accomplished athletes nonetheless. Co-president Rachel Mays has competed nationally and internationally in basketball and was a member of Dal’s basketball team. According to MacLellan, she is enjoying her transition to competitive rowing and helps build the team’s spirit and morale. “A few male athletes even learned to row only a few months ago and are excited to experience this advanced level of racing,” says MacLellan.